In the beginning of time, the great kingdom of China was ruled by Dragon Kings, mythical creatures that possessed great powers and wisdom. These fire-breathing creatures were fond of humans and treated them with lots of wealth. 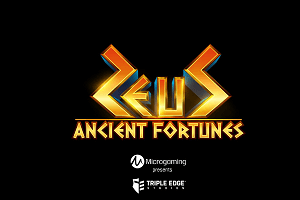 BetSoft decided to dedicate their latest title to these magnificent deities from the ancient world. 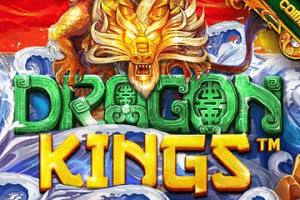 Dragon Kings is a five-reel slot with 10 fixed paylines, offering plenty of action and more than enough opportunities to win big, up to 280,753 coins. Five Dragons on five reels will get you a sweet reward, some tasty additional features and might trigger four different jackpots if combined with the Magical Dragon Pearl. The Dragon Pearl Scatter will trigger the Free Spins feature. The Dragon King is one of the most important symbols in the 2018 release. It appears only on reel 3 and acts as a Wild that doubles all wins. It will expand to cover the entire reel once it appears. There is also the sixth reel reserved only for the Magical Dragon Pearl, which helps gamers double free spins and trigger jackpots. The Dragon Pearl Scatter triggers the Free Spins feature. Gamers will also meet the Azure Dragon, Black Dragon, White Dragon and the Red Dragon. 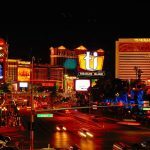 There are four different high-value symbols including Koi Fish, Jade, Coins and Ingots, as well as four playing cards symbols that act as low-value icons. 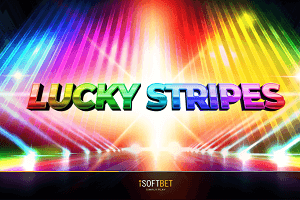 The BetSoft title features five reels, three rows and offers 10 fixed paylines, which pay left to right, starting from the leftmost reel. Three of a kind is the minimum form landing payouts. 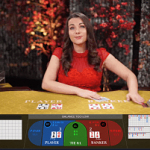 There is also the sixth reel, but it is only reserved for the Magical Dragon Pearl, which doubles freebies and helps gamers trigger jackpots. 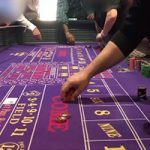 Betting is fixed at 10 coins per spin, but the coin value can be changed, meaning that gamers can bet as low as £0.10 and as high as £10 per spin. 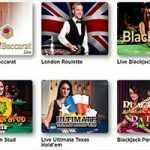 The 2018 release offers the option to buy the Free Spins feature if you are eager to try out freebies. All five Dragon Kings offer some specialties. Azure Dragon lands on reel 1 and once it appears it will award you with one respin, while holding all Dragons locked on their positions. Black Dragon is on reel 2 and he will multiply all winning combinations formed by him by 3x. The Dragon King is on the central reel and he is an expanding Wild that doubles all wins. White Dragon is waiting for you on reel 4 and he will expand to cover one more cell on his left or on his right. 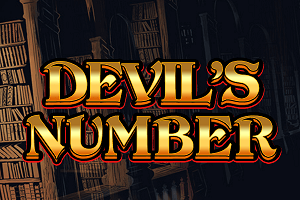 The Red Dragon appears only on reel 5 and gets you the cash reward up to 400x the line bet. Land three, four or five Dragon Pearl Scatters and you will get 6, 10 or 15 freebies. 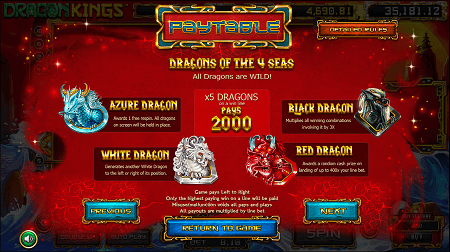 If the Magical Dragon Pearl lands on reel 6, gamers will double the number of free spins. It is possible to retrigger the feature. Land the Dragon King on reel 3 and the Magical Dragon Pearl on reel 6 and combine it with one or more Dragons and you will trigger the jackpot. 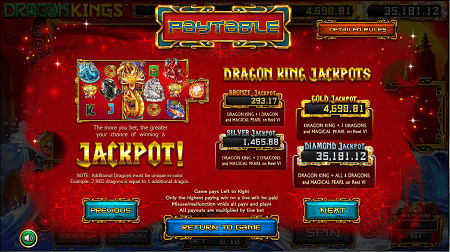 Depending on the number of other Dragons you manage to combine with the Dragon King and the Magical Dragon Pearl, you can get Bronze, Silver, Gold or Diamond Jackpot. 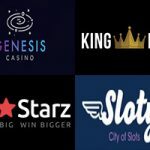 The biggest possible payout gamers might expect in the 2018 release is set at mouthwatering 280,753 coins. Set the coin value to the max and you can win up to £280,753. 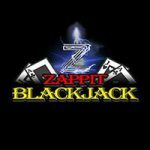 This payout is available in Diamond jackpot. The Free Spins feature and the Dragon features can also help you land huge payouts, especially because all Dragons act as Wilds. Dragon Kings’ RTP is 95.20%. Even though Dragon Kings might seem a bit scary, believe us when we tell you that the fire-breathing creatures are fond of humans and will help them land big wins, so there is no reason for you to be afraid of them. 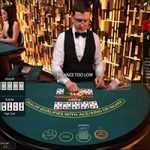 The BetSoft product is playable across all devices, including desktops and handheld gadgets, meaning that you can enjoy the 2018 release anytime, anywhere. 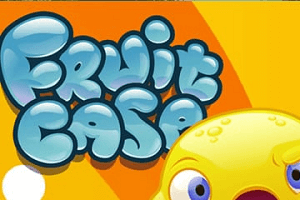 We can all agree that there are more than enough Chinese-themed video slots out there, but we have to say that BetSoft developed a video slot that will definitely stand out from the crowd. 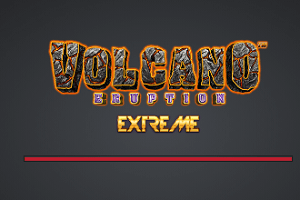 Crisp visuals, matching soundtrack and more than enough additional features that will keep you busy for a long time. Four Dragons of the four seas, all acting as Wilds and all adding one of their own additional features, accompanied by the Dragon King, the Expanding Wild that appears on the central reel and helps you trigger the jackpot. 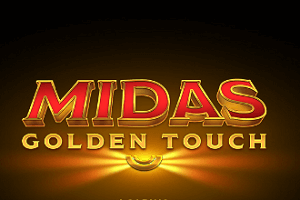 Dragon Pearls and Magical Dragon Pearls will bring you lots of free spins and a possible win of up to 280,753 coins. 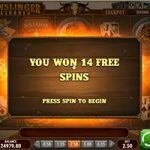 Play Dragon Kings slot at Dunder Casino!